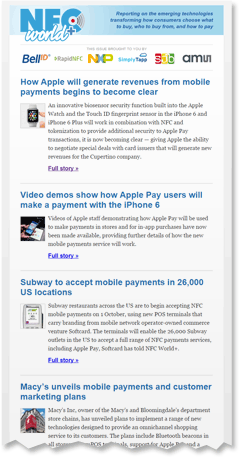 Our weekly email newsletter highlights the big stories and upcoming events and is delivered to 13,000+ opted-in readers. With an impressive average open rate of up to 30% it is an ideal place to run a campaign designed to drive traffic to your website. An opportunity to send a timely, tailored email message to our 13,000+ opt-in database. Email blasts are ideal for announcing new products, inviting customers to visit your booth at an event, conference delegate sales and promoting time-limited offers or launches on your own timetable. Either send us up to 500 words and a maximum of three images or provide a finished HTML file and we’ll send an email out to our readers on your behalf. Headline sponsor — an opportunity for one company to have a 50 word boxed text message at the top of the email newsletter, plus a logo and up to three links. Sponsor message — a 30 word text message, plus a link and a company logo, placed between two news items. Information on NFC World, our readership, the effectiveness of our results and our full range of marketing and advertising opportunities is available here. Note: Email blasts that promote resources located behind registration gateways or that otherwise attempt to collect identifying information about our subscribers will not be entertained, though we are happy to host and promote high quality white papers and other resources — and, optionally, provide you with lead data — via our Knowledge Centre. Find out more here.